Instead of my usual Feathers on Friday post, I have my 4H speech which I’m going to give this evening. I started birdwatching three years ago, when I was eleven. Besides compiling my life list and year list, I’ve also started reading about birds that are now extinct. It’s informative but also very sad, thinking about bird species, such as the Carolina Parakeet, that no-one will ever see again. Even sadder is how quickly most of these birds were exterminated, and how quickly they have been forgotten, unlike the Dodo and Passenger Pigeon which almost everyone still knows about. The only way I can think of to bring back a bird like the Carolina Parakeet, at least for a short while, is to tell you about it today. The Carolina Parakeet was the only parrot native to the United States, and could be found through most of the midwest and southeast, in forests and wooded river bottoms. It was a beautiful bird, possibly the most colorful ever to live in North America, with a green body, yellow head, and orange cheeks, and lived in large, chattering flocks. In the wild, before settlers came, parakeets ate fruits and seeds from many trees and plants, including thistles, grasses, maple, elm, and pine. But as Americans began to tame the frontier, cut down trees for farm land, and plant fruit trees and crops, the birds found themselves without their usual food source. The resourceful parakeets soon adapted, discovering apples and other fruits which they tore apart to get at the seeds, as well as corn and other grains. But a flock of parakeets could include 200 to 300 birds, and could decimate a crop or orchard quickly, so farmers soon came to consider them an agricultural pest, killing them in large numbers. It didn’t help the parakeets either that their meat was considered tasty, or that the birds had a habit, like many parrots, of returning to aid a wounded flock member in response to a distress call. This made it possible for a farmer to destroy whole flocks of the social birds. 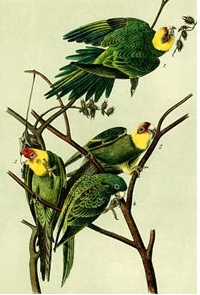 However, some farmers found the parakeets useful because they ate the seeds of, and thus controlled, invasive cockleburs, a noxious weed American farmers and gardeners have battled since colonial times. And in fact no other animal has been known to consume the cocklebur seed which contains a toxic glucoside. The celebrated bird painter John James Audubon reported as early as 1831 that the parakeet’s numbers had dropped dramatically in the previous 10 years. The population fell even more starkly in the mid-1800s. One of the very last populations of Carolina parakeets was located in Florida. The birds had been healthy, with good habitat, and weren’t persecuted by shooting or trapping and yet still died. Researchers have hypothesized that the parakeets might have fatally contracted a poultry disease from chickens at nearby farms, roaming free through barnyards, fields, and woods. The last known Carolina living in the wild died in 1905 in Missouri, and the last known living Carolina in captivity died at the Cincinnati Zoo in 1918. The Carolina Parakeet was declared extinct by the American Ornithologists Union in 1939. There are no native parakeets of any species left in the United States. This is a sad story, but it’s also an educational one. What happened to the Carolina Parakeet is similar to other North American birds that have become extinct in the last 100 years. In many cases, the birds lived and flew in large flocks, were mostly unafraid of humans and slow to flee. Until the arrival of European settlers in North America, these characteristics weren’t a problem for the birds. But the settlers arrival meant a need for more food, which brought overhunting, and loss of habitat as settlers spread through the continent clearing forests and native prairie grasses for more farmland. These story of the Carolina Parakeet shows us again how everything is interconnected. As the American poet Robert Frost said, QUOTE “Nature is always hinting at us. It hints over and over again. And suddenly we take the hint.” UNQUOTE I hope in the case of birds that are now on the edge of extinction, we can start paying attention to the hints. This entry was posted in General Birding, Winter and tagged 4H Speech, Carolina Parakeet, Extinct, Extinction. Bookmark the permalink. 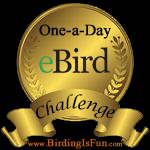 This is wonderful PrairieBirder and you are going to knock them out with your speech! Thank you very much Mia. Thank you very much Sally, I’m glad you like it. I once saw some specimens of the Carolina parakeet at an ornithology lab. They were beautiful with their bright colors. I tried to imagine what it must have been like to see a flock of them flying overhead. It is our great loss.. It is a very good speech and an important one. It would be wonderful see the specimens of the parakeets, you were very lucky to see them. Thank you very much Gene. Great speech! I bet you’ll open some eyes with it. Good luck advancing the great and worthy cause of conservation! Thank you Nicholas, I’m glad you like it. Excellent speech on an important topic and very well written. This is an amazing speech. Good for you and thanks for sharing it on your blog.